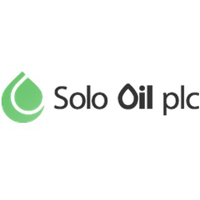 Solo Oil plc (LON: SOLO) has today noted the announcement made today by Aminex plc relating to operations in Tanzania and as set out below. The Company holds a 25% beneficial interest in the Ruvuma PSA and 8.3918% interest in Kiliwani North-1. The Company has advanced drilling and seismic programmes over the Ruvuma PSA acreage while it progresses satisfaction of conditions required to close out a farm-out agreement signed with the Zubair Group in early July 2018. An extraordinary general meeting of shareholders will be held to approve the Farm-out on 4th January 2019. The Company has finalised the Chikumbi-1 executive drilling and completions programmes, has identified and selected the service companies required to operate all aspects of drilling and, based on a competitive tender process, has selected Sakson Drilling and Oil Services DMCC to drill the Chikumbi-1 well. The Company has also identified and designed an approximately 220 km2 3D programme over the Ntorya development area. Further, Aminex has signed a conditional rig sharing agreement with Heritage Oil Limited in Tanzania in order to reduce mobilisation/demobilisation costs for both parties. Pending the successful completion of the Farm-out, Aminex will be fully carried through to production, which will include the drilling of multiple wells, seismic acquisition and construction of associated infrastructure. The Chikumbi-1 well is located within the Mtwara Licence of the Ruvuma PSA, in Southern Tanzania, approximately 4 km west of the successful 2017 Ntorya-2 appraisal well, in the onshore portion of the Ruvuma Basin. Chikumbi-1, which will be drilled to a total true vertical depth of 3,485m, will fulfil one of two remaining exploration commitment wells and, upon success, is intended to be completed as a producing well in a future development programme. The well will have two primary targets: to further delineate the Ntorya Gas Field (which is projected to encounter stratigraphically trapped Albian aged reservoirs, approximately 120 meters up-dip from Ntorya-2 and approximately 195 meters up-dip from the Ntorya-1 discovery well) and to test a deeper, stratigraphically trapped Late Jurassic Exploration target. RPS Energy Consultants Ltd. has independently assigned the Albian aged Ntorya Gas Field a mean un-risked GIIP (Gas Initially in Place) of 1.87 TCF, with total combined gross 2C Resources of 763 BCF, and has additionally assigned 936 BCF of 2U Resources (previously equivalent to “Best Estimate” Prospective Resource) to the Jurassic aged Chikumbi prospect. The Company engaged Schlumberger SEACO Inc. to remediate and troubleshoot a faulty sub surface safety valve on its Kiliwani North-1 well. Schlumberger were mobilised to location and the SSSV was repaired. During the operation the well was fully opened and test gas flowed to the plant for a short period. The Company believes that there is a fluid column in the well and is analysing the operational and testing data. The Kiliwani North licence is located off the East coast of the Tanzanian mainland in shallow waters. The licence area contains several islands, which provide onshore drilling opportunities, and is on trend with the Songo Songo gas field. The licence has an expiry date of 2036 with no further commitments, has a Gas Sales Agreement in place and access to a Gas Facility with significant ullage. The Kiliwani North gas field has recovered 6.4 BCF to date which has generated $18.3 million in gross revenues. As reported earlier in the year RPS have attributed a mean GIIP of 30.8 BCF to the Kiliwani North structure, which is believed to be compartmentalised. Mapping by Aminex has identified a structural lead, Kiliwani South, with a mean estimated GIIP of 57 BCF. The Company is the operator of both the Kiliwani North Development Licence and the adjacent Nyuni Area PSA with 63.8304% and 100% working interests respectively. The Company has identified areas to conduct the acquisition of 3D seismic with the intent of progressing low-cost drilling prospects which can be tied into the existing facilities and monetised. Click AEX SOLO for the full archive.